As the world focuses on Tuesday’s historic handshake between President Obama and Cuban President Raúl Castro, we look back at the pivotal role Cuba played in ending apartheid and why Castro was one of only five world leaders invited to speak at Nelson Mandela’s memorial. 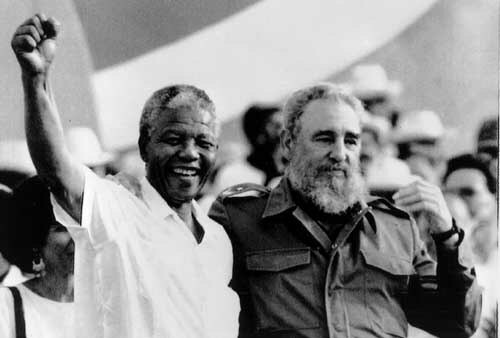 In the words of Mandela, the Cubans ‘destroyed the myth of the invincibility of the white oppressor … [and] inspired the fighting masses of South Africa.’Historian Piero Gleijeses argues that it was Cuba’s victory in Angola in 1988 that forced Pretoria to set Namibia free and helped break the back of apartheid South Africa. We speak to Gleijeses about his new book, “Visions of Freedom: Havana, Washington, Pretoria, and the Struggle for Southern Africa, 1976-1991,” and play archival footage of Mandela meeting Fidel Castro in Cuba.